The TiVo Roamio OTA was one of the most popular TiVo models we’ve ever sold. For $400, it included All-in (lifetime) service, and it could record four channels at once, and work with TiVo Minis. The OTA models ONLY work with over-the-air antenna (no cable or satellite). TiVo recently replaced it with the TiVo Bolt OTA. The Bolt OTA is a great unit that we love also, but to get it with All-in service costs $500. We now have refurbished stock of the Roamio OTA, with All-in service, at a better price: $349.99! We’re very excited to be able to supply this unit again. As best we can tell, TiVo has used two or more suppliers for the fans in these units, and possibly more than one model from some of these suppliers. 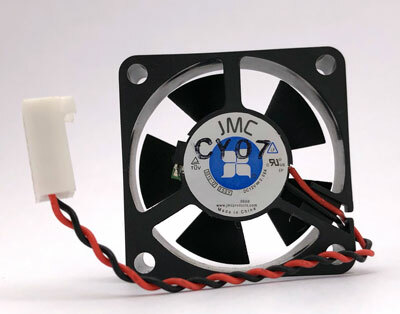 In order to figure out the best replacement option, we contacted several suppliers and tested many fans, and we now how what we think is the best possible replacement. This same model seems to be what TiVo is using in the current Roamio OTA Vox units. We also have a video on that page that walks you through the installation, step by step. This is compatible with model numbers TCD846500, TCD846510 and TCD846000. Please note that this will NOT work with the Roamio Plus and Pro. We have that fan kit here. Today, TiVo released the TiVo Roamio OTA VOX. As before, this Roamio OTA VOX includes lifetime service, so no monthly fees ever apply. The unit has four tuners, the ability to stream Netflix, Amazon, Hulu, and many more services, and the ability to support TiVo Minis. Please see our TiVo Roamio OTA VOX info on our website. Pricing, as before, starts at $399.99. TiVo DVR Sales on BOLTs and Roamio OTAs! Through 2/4, we’ve got nice low prices on TiVo BOLTs and TiVo Roamio OTAs. TiVo BOLT prices (4 tuner units) are down a minimum of $40 – see the TiVo Bolt options here. and TiVo Roamio OTA units with All-in/Lifetime service are on sale for $30 off – see all TiVo Roamio OTA options.